Koreans are protesting against the latest 007 film "Die Another Day." 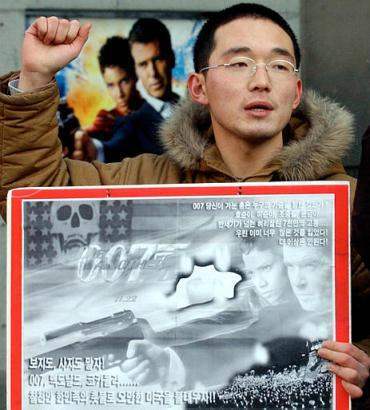 The photo shows a young South Korean Student demonstating against the movie. The regime in North Korea Sunday issued a new attack on the latest James Bond film, Die Another Day, saying it ''makes mockery of the Korean nation'', and showed that America plans war on the Korean peninsula. Quoting an obscure group, called Solidarity of Youth and Students for Implementing the June 15 South-North Joint Declaration, the North's state news agency demanded that the US stop showing the film. ''The film represents the real intention of the US keen on war as it considers the North as part of an 'axis of evil', fans up division and confrontation between the South and the North and insults and makes mockery of the Korean nation,'' the group declared. The 20th Bond film has caused anger in both Koreas, with its depiction of a renegade North Korean general's son who plots to dominate the world with a solar weapon. South Koreans, known for their sensitivity to perceived foreign slights, have been urged to boycott the film by local activists. In particular, critics of the film - unimpressed by arguments that Bond is British - have decried scenes in which he makes love in a Buddhist shrine, and in which an American general orders South Korean troops mobilized. However, most anger focused on a scene of a farmer ploughing with a water buffalo. Though it is possible it depicts North Korea, furious Southern students complained that Americans were depicting their highly industrialized homeland as a Third World backwater. The film opened on New Year's Eve in South Korea, despite loud protests outside several cinemas. The above story from Reuters begs a number of questions. 2). The "partnership" between the U.S. Military and Hollywood should be well known by now. Meetings have been held between studio executives and representatives of the Pentagon, on ways Hollywood can help in the "war on terrorism." The film "Black Hawk Down" was identified as one that was the result of the partnership... is "Die Another Day" another? Mr. Bush has identified his "Axis of Evil" and low and behold, one dastardly member of that Axis shows up in the latest Bond film. 3). The cultural insensitivity of showing this film in Korea... especially at this time, is utterly amazing. While the Reuters story leads with a statement from the hard-line regime of North Korea, the fact that the people in the South of the country are holding protests and organizing boycotts against the movie is significant. If the repressive regime in the North had not made a fuss... would we have heard anything at all about the protests going on in the South? There have been massive protests in the South over the killing of two Korean girls who died when a U.S. tank rolled over them. Now comes 007 to rub salt in the wounds. America's message to the Korean people seems to be... "Die Another Day." 4). Aside from the fact that Asians are virtually invisible in Hollywood... except when cast as martial arts warriors or evil villains.... there's another twist to the racism in the latest Bond film. A few years ago, some African American activists urged a boycott of the Warner Brothers dubbed television version of the Japanese anime "Pokemon." The animated show introduced a new character, who was Black and named "Jynx." The critique was that the cartoon character was a racist stereotype... especially with a name like Jynx (the connotation of the word being bad luck and trouble). Guess what... 007 Star Halle Berry plays a character named "Jinx." Have any film critics mentioned this?